12 Sep 2018 --- Tereos has started its potato campaign in France which will be spread over 160 days with almost 9,600 hectares of starch potatoes expected to be exported. To ensure the competitiveness of this cooperative sector, Tereos has invested a total of €25 million (US$28.9 million) over the last three years and is taking further steps in terms of storage while pursuing innovations in conservation. According to latest European Union estimates, the performance of the 2018-2019 campaign will be less than the average of the last five years. Tereos is taking new agronomic and environmental measures to promote production, according to the company. The starch mill will transform, for the second year in a row, nearly 9,600 hectares of starch, grown in the Haussimont and Vic-sur-Aisne areas. "Thanks to the significant investments made to have a supply of high starch quality, the Haussimont site now has a range that meets the needs of international standards and the high demands of its customers,” says Alexis Duval, Chairman of the Management Board of Tereos. Another critical point of the campaign is the development of an underground storage plan. 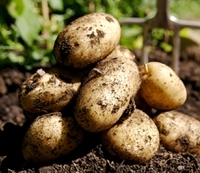 To ensure the sector's competitiveness, the Tereos Potato Commission is to study the specific issues of production to enhance the productions of cooperating partners chaired by Pascal Foy. The company plans to increase the existing storage capacities by around 100,000 tons by 2020 to reach 50 percent of total production. The objective is to over time master the conservation of potatoes on each farm, a major challenge of this campaign is to optimize the yield of the harvest. This expansion of storage capacity is currently being implemented with the development, within the farms and existing buildings. Outlets for potato starch from cooperating partners in the regions of Haussimont and Vic-sur-Aisne are mainly for the European agri-food market and there have been developments in export, especially in America and Asia. Starch is used across several applications, especially in the preparation of sauces, prepared dishes and Chinese noodles because of its texturing and thickening properties, says Tereos. It is also of interest to industrial customers in the paperboard and paperboard sectors. These technical markets absorb nearly 20 percent of volumes. In addition, Tereos says it has an innovation this year, a piloting tool installed on the company’s trucks. This software, which will be implemented gradually on the Haussimont site, acts as a geolocation system on all the loading cranes as well as on the entire the transport fleet. The objective is to ensure the control of the routes of the trucks and optimize logistics flows, says Tereos. Tereos France Potatoes Starch Texturing Thickening Storage.